I have promised my wife I will teach her how to ride a snowboard, but she was kind enough to let me go out on my own and enjoy myself the first day. So I got up bright and early and went out to rent some equipment. Like any ski resort, Niesko has plenty of ski rental places but I selectd one called Rhythm Sports because it seemed like they might have some higher quality stuff. Sure enough, with the premium package I got high quality equipment from Burton. Geared up and ready to go I hit the slopes and my first run was fantastic, sun shining and a thick layer of soft, fluffly powder right there in the main slope. I was smiling and yahooing all the way down. A short while later it started snowing and the visibility went to pot but it was still great riding. Since I go skiing so extremely seldom I never bothered to send my ski clothes to Taiwan, so now that we did go, I had to cobble together a sort of makeshift ski outfit from various outdoorsy clothing. Rain jacket and pants worked well as an outer shell but it quickly became cold in the lift. A light weight down jacket solved that problem and despite temperatures as low as minus eleven I felt nice and warm all day. The only real problem was the cheap goggles I bought, wchich had a tendency to fog up and then the fog would freeze on the inside. Since it was snowing I didn’t have any good opportunities for taking photos but I got two of them. 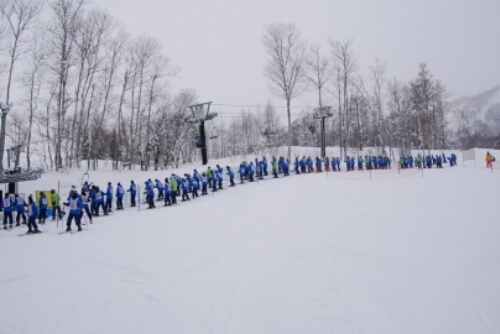 Japanese ski school, almost looks like an army. 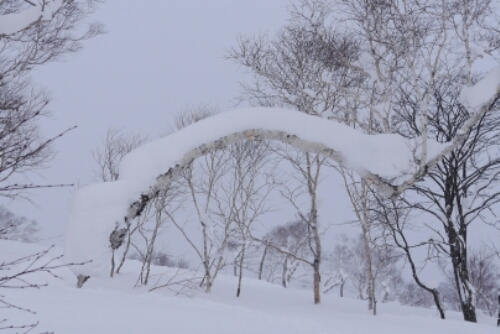 All in all I had a great day, though it felt a bit off to have Japanese food in the ski slope. When I came back to the hotel I found out my wife had a great day too. … As I was about to finish this post there was an announcement telling us to come to the lobby if we want to throw soy beans. Apparently there is a Japanese tradition of celebrating the first day of spring by throwing beans or peanuts on the ground to dispel evil. So all the guests who joined got a cup of peanuts each, and had to throw them at hotel staff wearing demon masks, while uttering some special frase. Kind of wired but a fun experience. … Now all that remains is to let my sore legs rest until tomorrow.